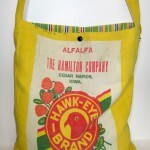 Yellow “Hawk-Eye” Seed Bag, Reversible Tote | w3bCh1ck! This entry was posted in Up^Cycles on April 10, 2010 by admin. I love these 50lb seed bags. This one is actually 100% rayon, “Bemaron-All Rayon Bag”. The colors are fantastic, very bright and vibrant with a great bird head logo. 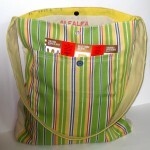 It folds up really well and is completely reversible. I used two different striped upholstery fabrics for the inside and added a large pocket with a sparkly blue decorative button. Snap at the top for secure closure. Click on the images to view more pictures on my Etsy store.